Giovanni Battista Tiepolo was the purest exponent of the Italian Rococo. He created fresco decorations and paintings for palaces and churches throughout Europe with an unprecedented, inventive freedom of form and expressive, shimmering colors. A master of the airborne figure and of perspective, he excelled in creating the illusion of infinite space articulated with luminous colors and atmospheric effects. 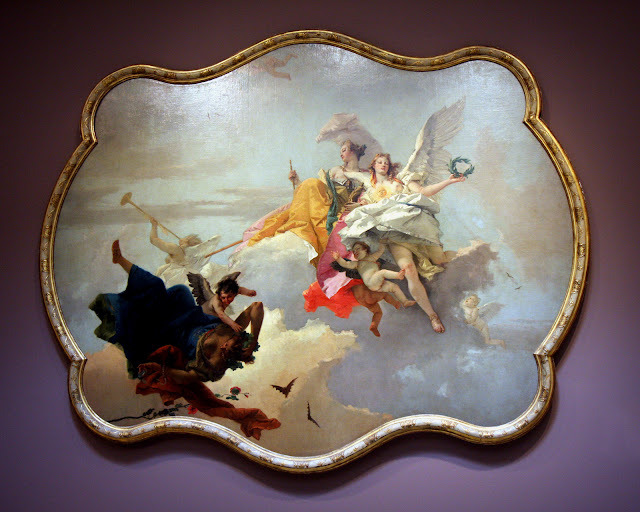 This painting was designed for a ceiling in the Palazzo Manin in Venice. Virtue is dressed in white with a sun symbol on her breast. Beside her, Nobility holds a statuette of Minerva and a spear. To the left, Fame blows her trumpet. Below, the figure of Ignorance is being vanquished. The poppy wreath falling through the sky alludes to the "sleep of the mind." The bats symbolize ignorance, which refuses to see the light of wisdom and knowledge. The figures of Virtue and Nobility display a distinctly lofty, detached air indicative of the mythological world they occupy.